With a state as hot as Texas, giving your kids their first snowy Christmas or the gift of an all-out snowball war is a feat that’s hard to accomplish. Even though Dallas does get its fair share of snow every now and then, planning a snow day is nigh impossible. But how is artificial snow made? We understand that one of the biggest joys for children is having the experience of playing in the snow. DFW Snow Parties is always available to help in that endeavor through our much-celebrated snow parties. However, producing snow when the customer wants it isn’t exactly magic; but is science. Before we get into how we make it snow, let’s talk about the real stuff and where it comes from. You may have already noticed that certain conditions in nature have to be met before even a single snowflake hits the ground. It has to be cold enough and the humidity has to be at a certain level for snow to begin to form. For snow to form naturally, a cloud of water drops must freeze around some particulate matter like a speck of dust. Known as a nucleating agent, that speck of dust acts as a seed for the freezing water to cling to and build upon. As that first crystal forms over the nucleating agent, more freezing water cling to the surface of the ice, making what we know as a snowflake. As the snowflake gets heavier and heavier with additional ice, it breaks the pattern of the wind and gently falls down to the ground. All of this really sounds more like a science than Mother Nature, but in all honesty, all natural things stem from a complex process. To make snow artificially, a similar process has to occur and DFW Snow Parties has the scientific method of snow creation solved. Creating artificial snow depends on taking these items and putting them into a specific production process that we follow. These steps are a basic outline of the snow production process, and it can be done outdoors if the temperature is below 30 degrees, or in the big Mr. Cool Snow Parties’ freezers. The water is mixed with the nucleator, usually a natural protein, which helps attract water molecules and ensures that more of the water droplets freeze. 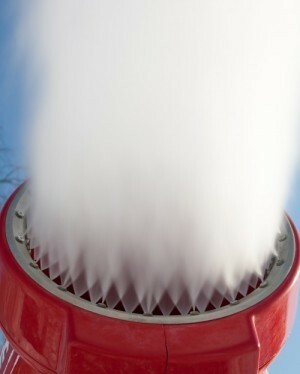 The compressed air is forced through the snow machine and is combined with the cold water. The air atomizes the water so the water splits into tiny droplets and blows them into the air. The tiny droplets form ice crystals and land on the ground as snow. Luckily for the clients that request snow parties, new technology for creating artificial snow has come about as the years have passed. The opportunity to use artificial snow in a variety of circumstances has meant more people than ever have seen snow in some form or another. Is Artificial Snow Not Real Snow?! Artificial snow is a scientific mystery of its own. It is made of real ice particles, just like real snow. The only “artificial” feature of artificial snow is that it’s created by man rather than created naturally by the earth’s weather patterns. In addition to use at large venues like ski resorts, artificial snow has also become a popular feature at birthday parties and at gatherings where snow can make everything a little bit more beautiful and exciting. It was in 1975 when a graduate student made a breakthrough by discovering how to use a nucleating agent to increase the production capabilities of the snowmaking machines. That graduate student’s discovery was eventually trademarked. Artificial snow companies also began using a variety of additional elements to create and maintain snow such as fans, electronics, and computers. Artificial snow machines are a fairly regular part of today’s skiing venues. One of the biggest reasons for the development of artificial snow machines was the rise of skiing for fun. It wasn’t until the 20th century when skiing at resorts started to become a widely enjoyed sport, but snow didn’t always cooperate in the busy season. Artificial snow was a solution for resort owners when natural snow wasn’t available. After the introduction of machines capable of creating artificial snow, people started using artificial snow in a variety of ways for things like snow parties and holiday decorations, particularly in areas where snow wasn’t common or was never a guaranteed part of winter weather. The machines tasked with making artificial snow also became more reliable and capable of manufacturing large amounts of snow as time passed. DFW Snow Parties is Ready to “Chill” With You! Hosting a snow party is fun for kids and adults, and it’s the icing on the cake for just about any special celebration. Create a winter wonderland for your wedding, or give a child an exciting and snowy birthday party, even if their birthday is in the middle of the summer. 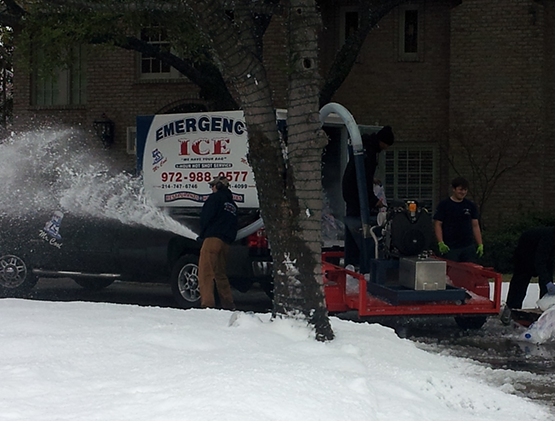 DFW Snow Parties will deliver your artificial snow at any time and in any quantity. If you’ve never used artificial snow at home before, we encourage you to contact us to discover all the ways our snow parties are the best in town!